My daughter is out of school this week so we have a chance to paint and bake and do fun projects that we love this time of year. 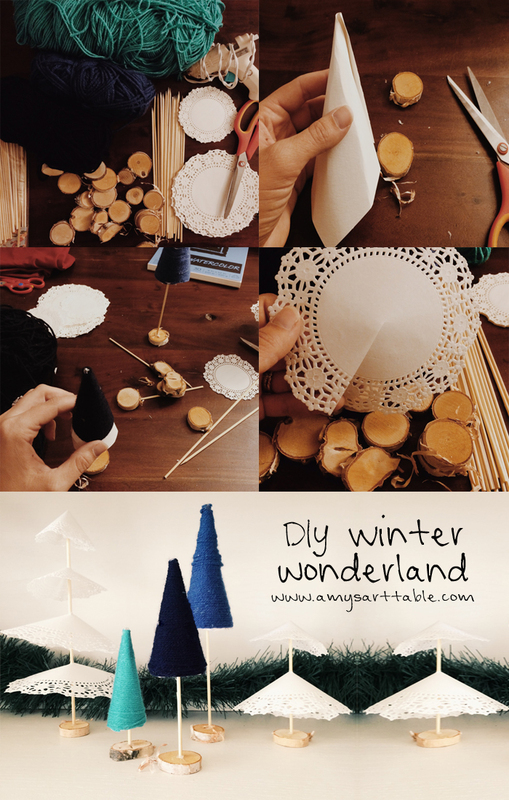 We decided to work on creating a winter wonderland for imaginative play this week and so far its coming together really cute so I thought I’d share the process. 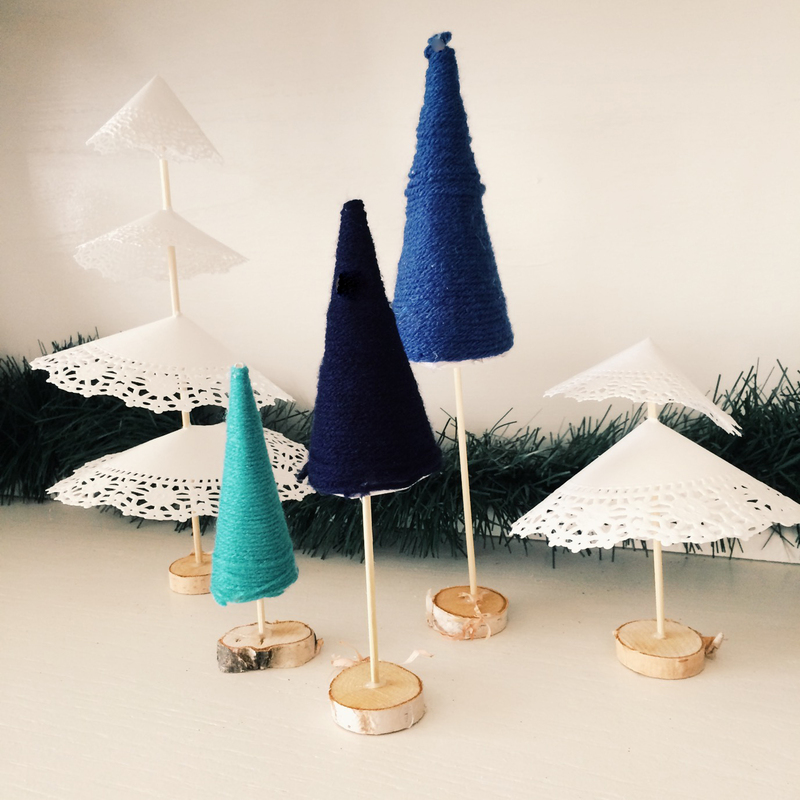 We’ve started with creating some trees from paper, doilies and yarn. 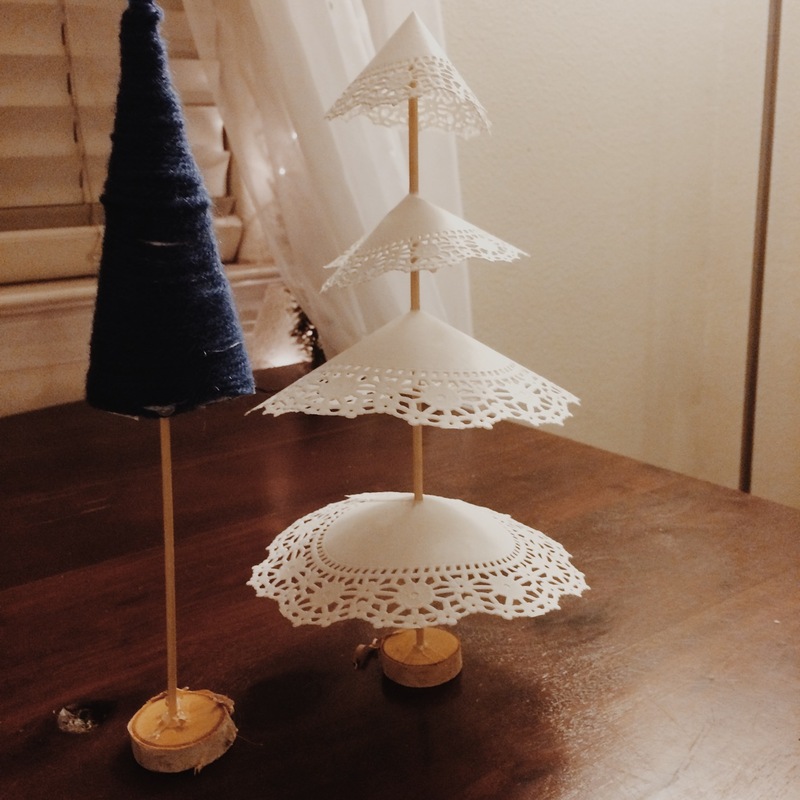 I was saving to my Holidays board on pinterest the other night when I got inspired by blue colored paper trees and doily trees I saw in other projects. 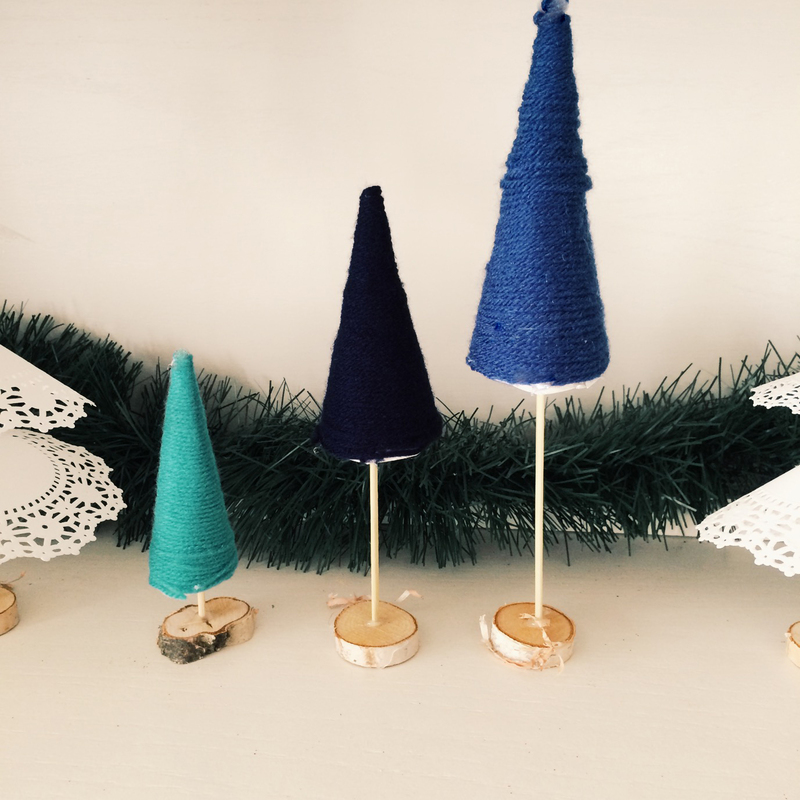 Instead of using paper for the blue trees, I decided to make a paper cone and wrap different shades of blue yarn around each one. 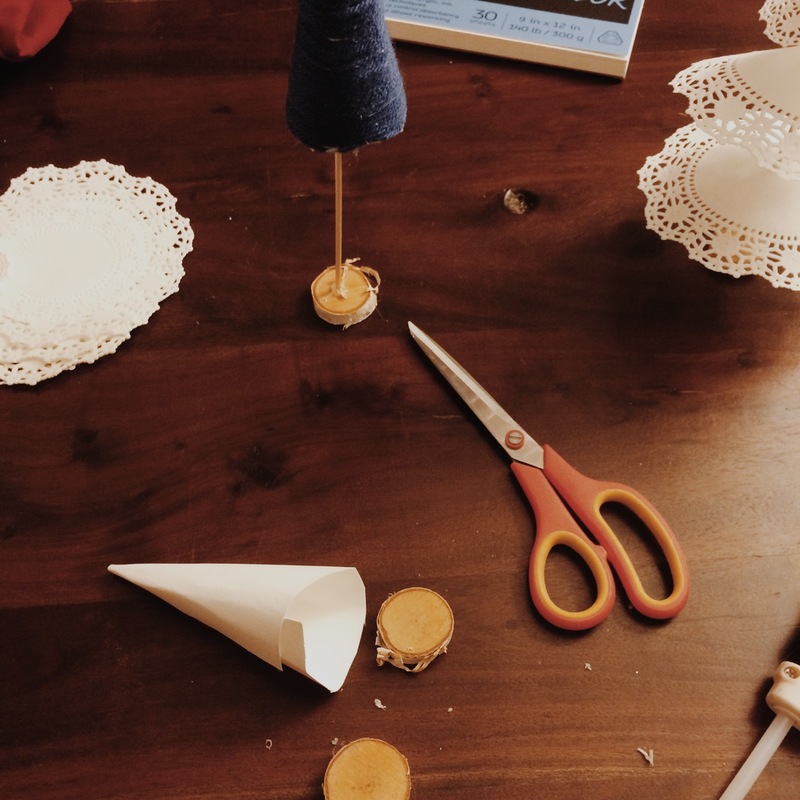 Start by creating a paper cone with a square piece of either cardstock or watercolor paper. 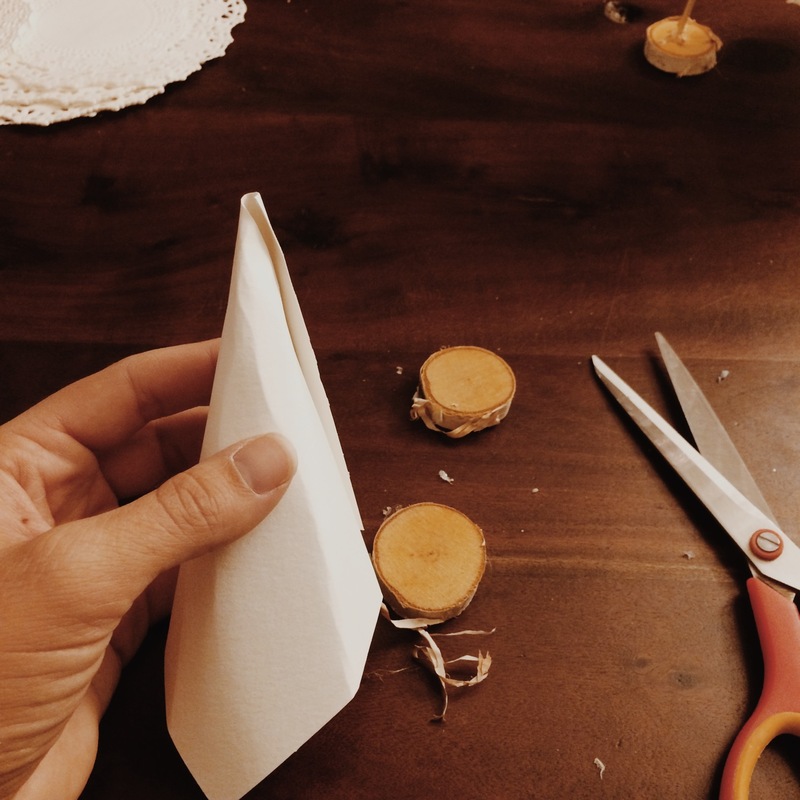 You’ll roll the thick paper up and glue it to form the paper cone. Next, we’ll trim the bottom corner off of the cone shaped paper. 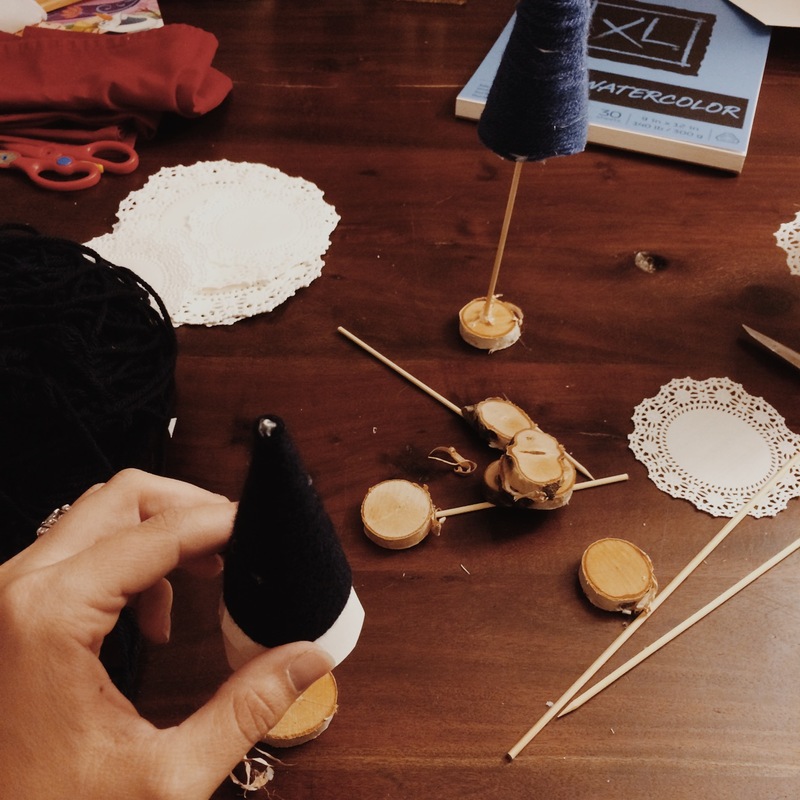 Then it’s time to start wrapping the yarn from the top of the paper cone. I put a dot of hot glue at the top to hold it in place as I started. 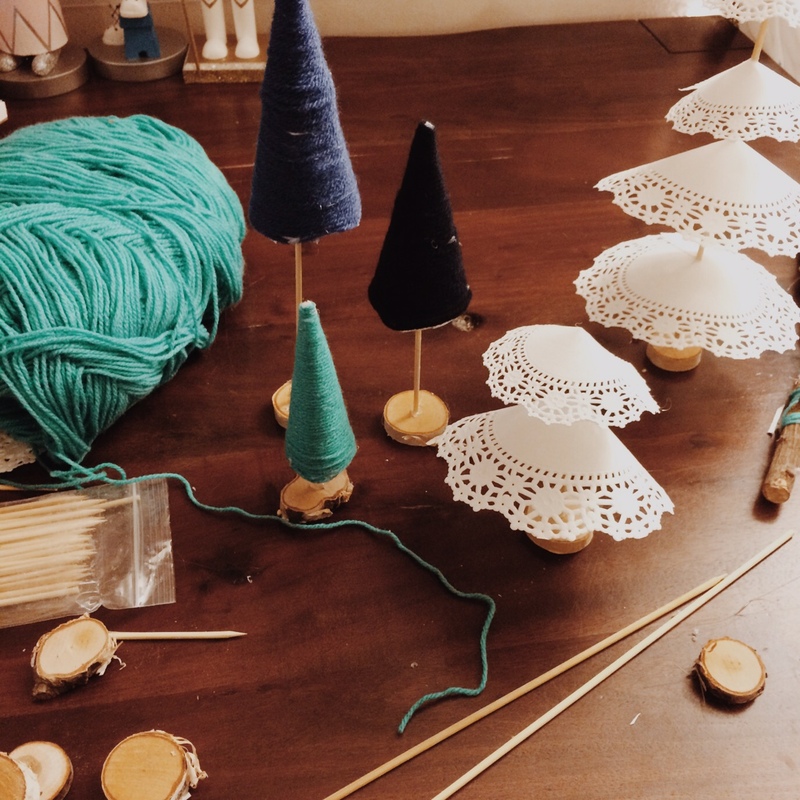 Continue wrapping the yarn all the way down the cone until you’ve completed the yarn tree, glue the yarn intermittently along the wrapping to hold it in place and at the bottom with a little hot glue. Next, put a dab of glue on the pointed side of your skewer and attach it to the inside of the cone. 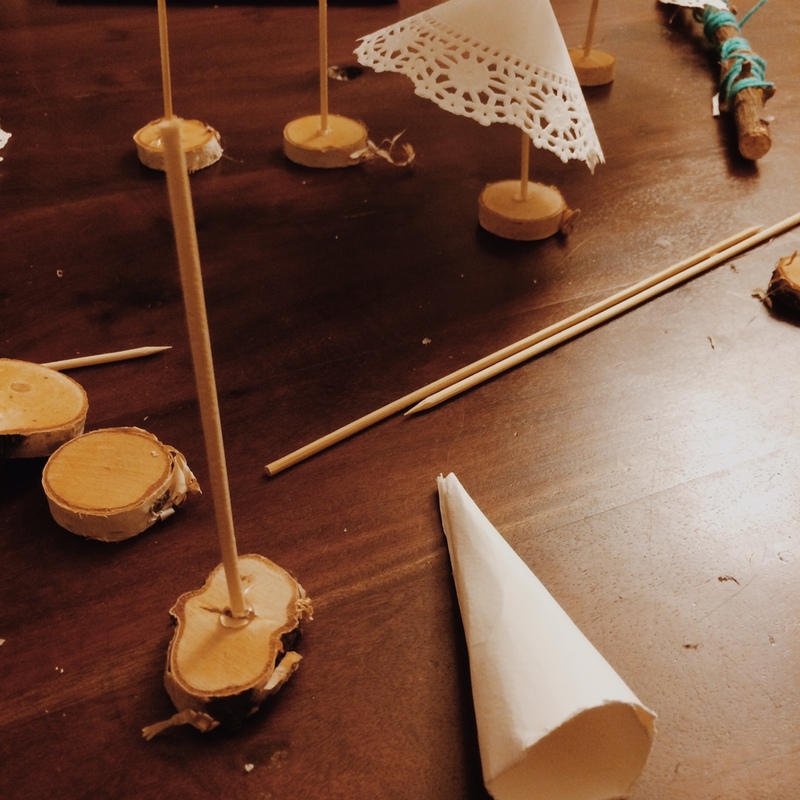 Attach the bottom of the skewer to the wooden birch disc with another dab of hot glue. 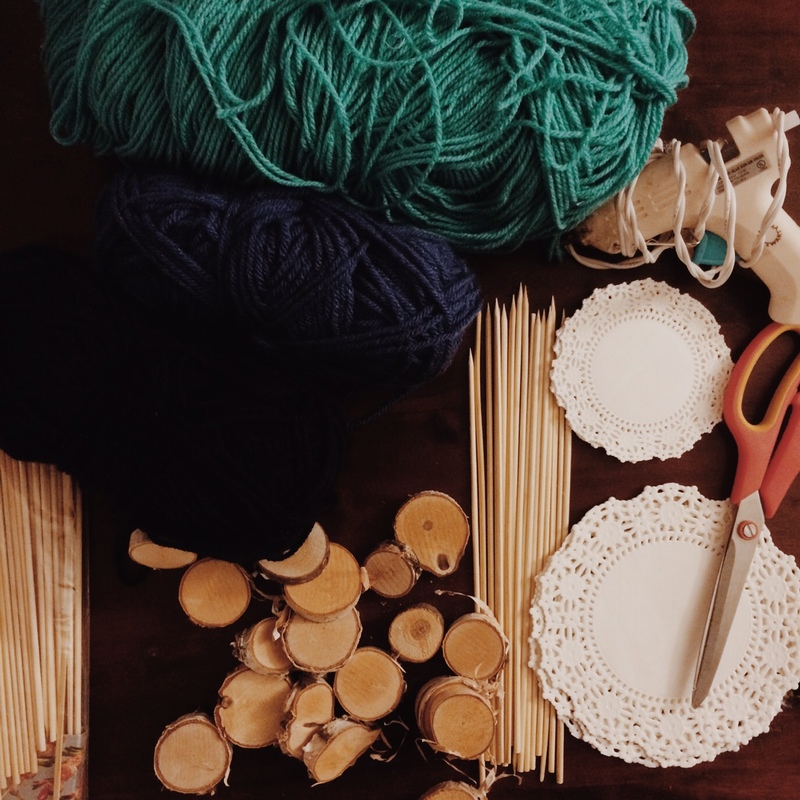 This should complete your yarn tree! I made a few different trees in varying heights and yarn colors. 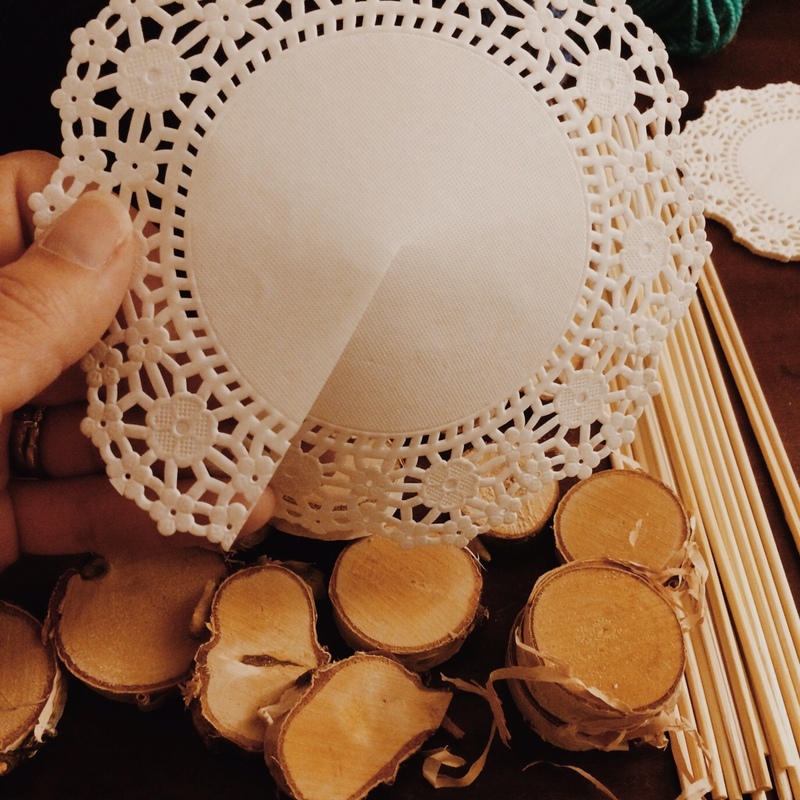 Start with cutting the largest size doily to its center as shown in the photo below. Next, you can overlap the cut sides to create a cone shape by gluing it together. Attach one skewer, trimmed or full size to one birch log piece, with the point at top. 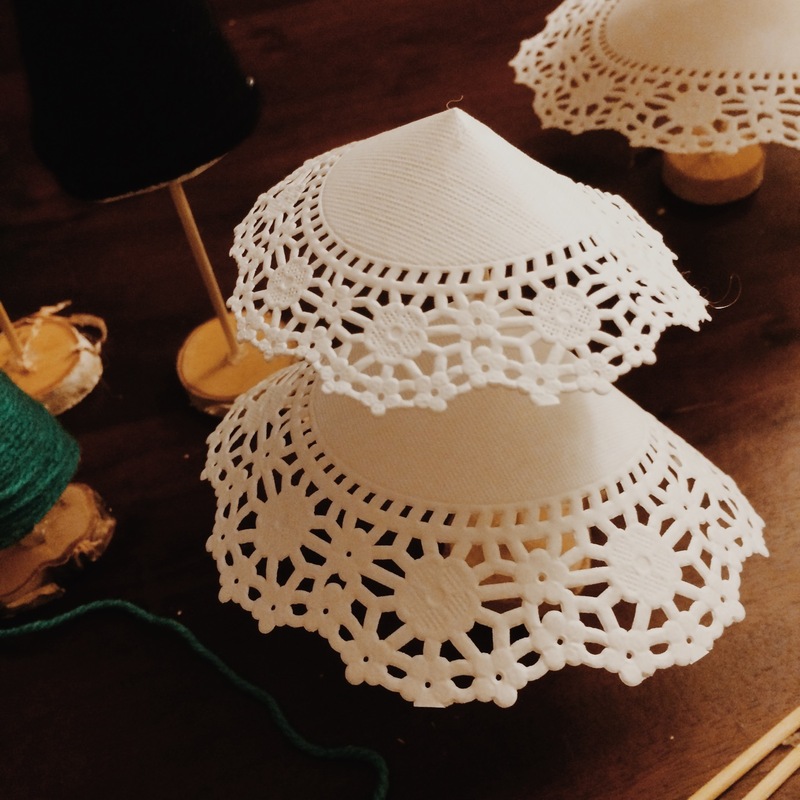 Slowly, puncture the center of your cone shaped doily and push it toward the bottom. 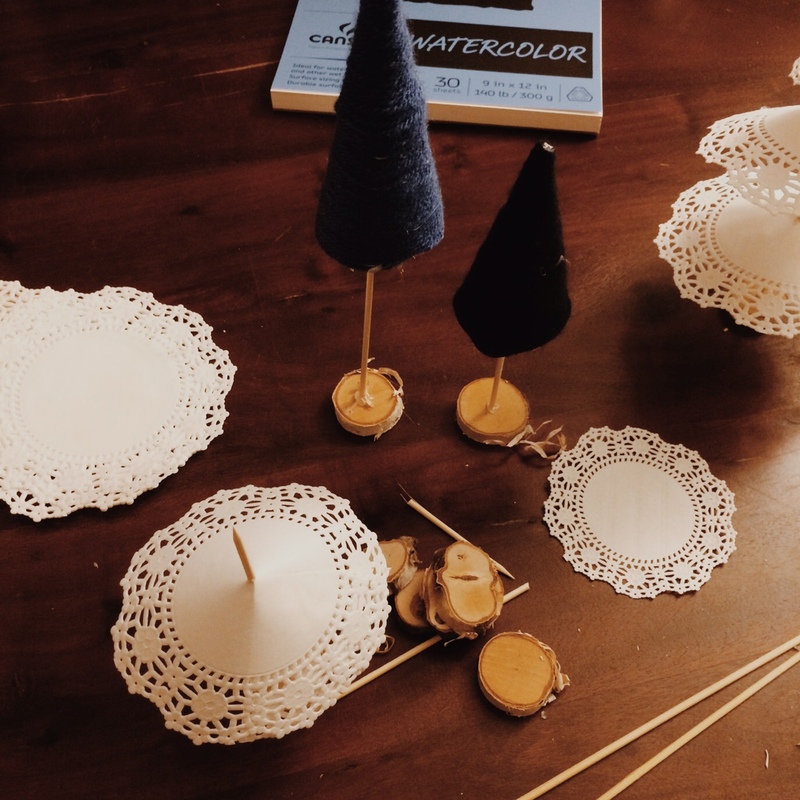 Continue this process in smaller and smaller sizes to create doily trees! 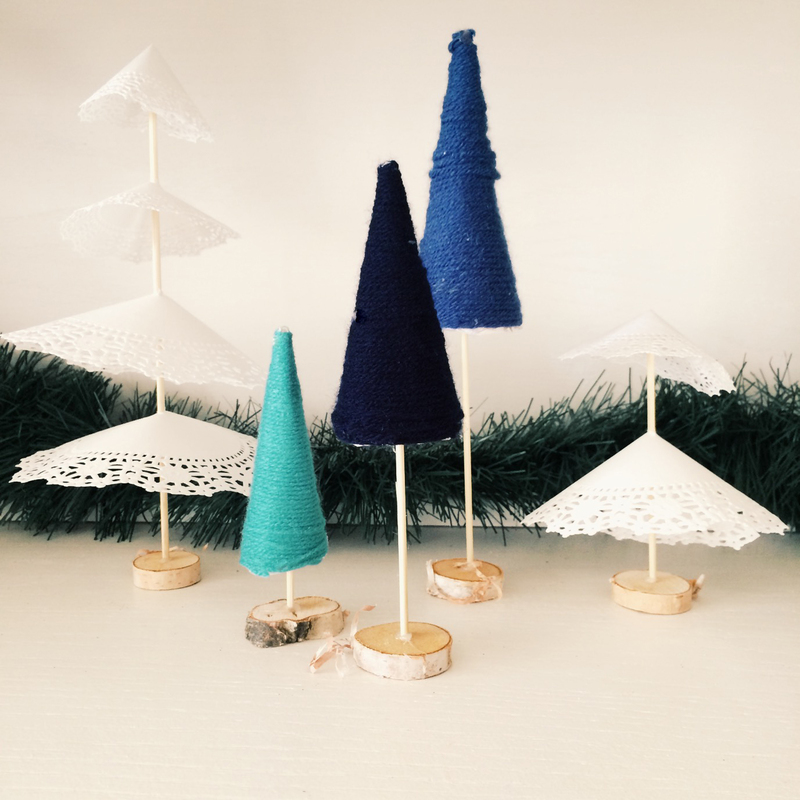 After you’ve created all the trees you’d like for your winter wonderland, you can use this as a little decoration on a credenza or mantel or you can let your kids have these items to mix with their small toys to create winter wonderland imaginative play. We like to use little disney figurines and calico critters to create some fun imaginative scenes. My kids have been enjoying Christmas play all week, I hope yours can too. Next week, we may start to hang up some of the doilies as snowflakes to make the scene even more wintery and also start making some buildings out of boxes! Be sure to subscribe on the home page for a special email coupon going out to all of my readers for a black friday discount on my etsy shop mugs, cards and prints! Hope you all have a wonderful Holiday this week!